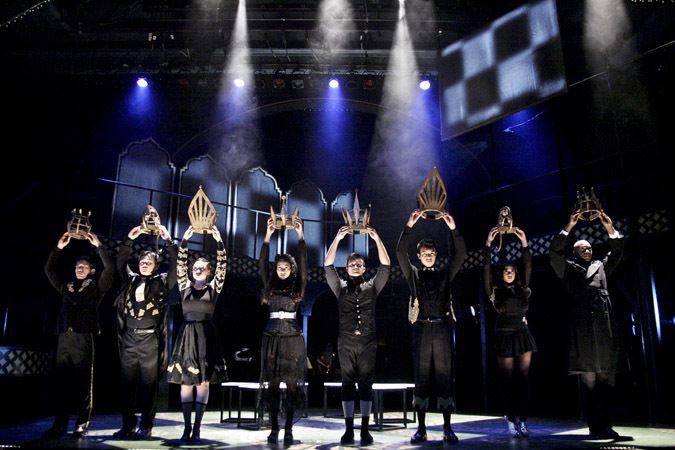 Ensemble of “Chess.” Photo by Michael Lamont. When the musical Chess opens at the David Henry Hwang Theater tomorrow night, it will look a lot different from the original production, which premiered in London’s West End in 1986 and ran for three years. It also will stray from the ill-fated Broadway version, which opened in 1988 and lasted only two months — and from a third version that served as the Los Angeles County premiere, produced by Long Beach Civic Light Opera in 1990. Director Tim Dang, who is also East West Players’ (EWP) producing artistic director, decided to re-imagine Chess for the 21st century with a multicultural cast. Elijah Rock, who is African American, stars as Russian chess player Anatoly. Joan Almedilla, who is a Filipina immigrant, plays his American love interest. Victor E. Chan, who is of Chinese and Filipino descent, portrays his American competitor Freddy. Four of the 15 Chess cast members are of mixed race.